Well, the answer is: There is a lot to see. Switzerland has so many beautiful places and I could have easily filled this post with 100 places I truly recommend, but instead, I focus on the very, very, very best places in Switzerland only. So, when you have a limited time in Switzerland (who can call himself so lucky and does not have a limited time there?) these are places you have to add to your Switzerland bucket list. Okay, here are my favorite lakes to visit in Switzerland. 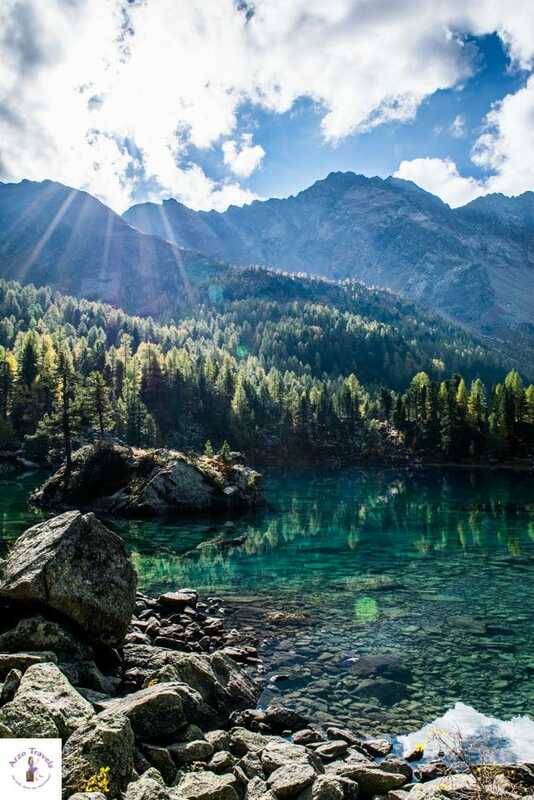 Oeschinensee is often considered the most beautiful lake in Switzerland and is located in Kandersteg. It isn’t that easy to get to as it is surrounded by mountains, so if you would like to see it you have to at least do a little bit of hiking. You can take a cable car to get up some of the way if you prefer, and it is definitely worth seeing as the lake has the most intense color! It reminds me a little bit, with its color and surroundings, of one of the Canadian lakes and if people say it is one of the most beautiful places in Switzerland, you won’t find me disagreeing with them! 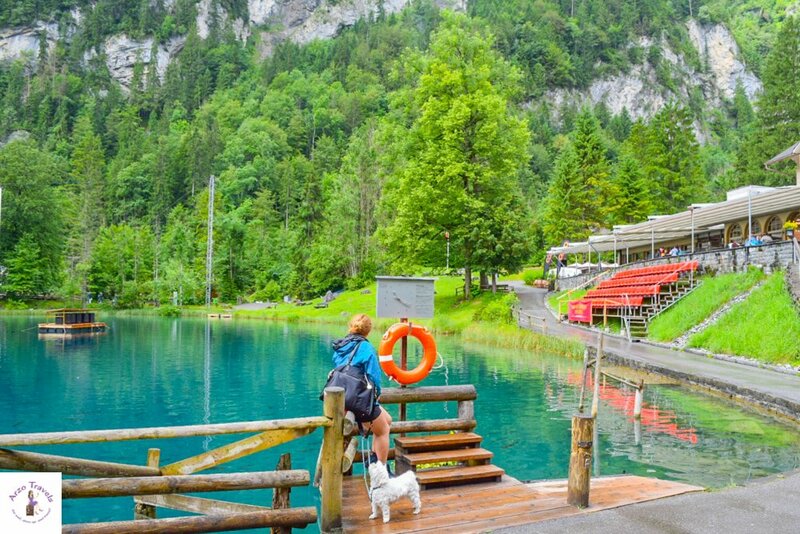 Blausee is another gorgeous lake in Kandersteg close to Oeschinensee that is just astonishing. It is a very very VERY tiny lake located in a national park and for a few euros entrance fee you can go and visit it. Though it is called blue lake, I personally see more of a greenish color but this is no bad thing. 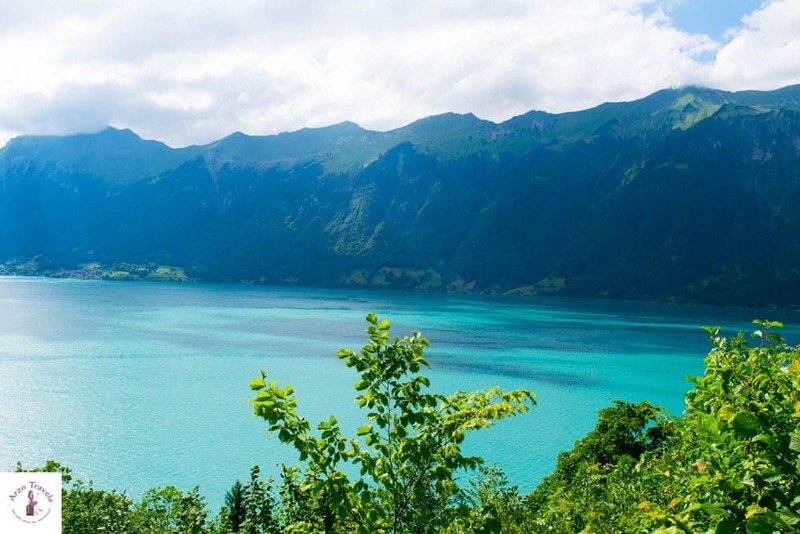 The myth says that the lake has this unique color, as a maiden actually died by drowning in the water and thus the color of the lake is actually the color of her yes. Though it’s extremely small, you can row boats there and once when I visited, there was even a big screen showing movies in the evening. Also, it’s a popular place for couples who have just gotten married to have their pictures taken. Lake Brienz is my personal favorite of Switzerland’s lakes- simply due to the fact that it has the most amazing color that I could imagine for a lake, it has extreme clarity and very pretty surroundings. 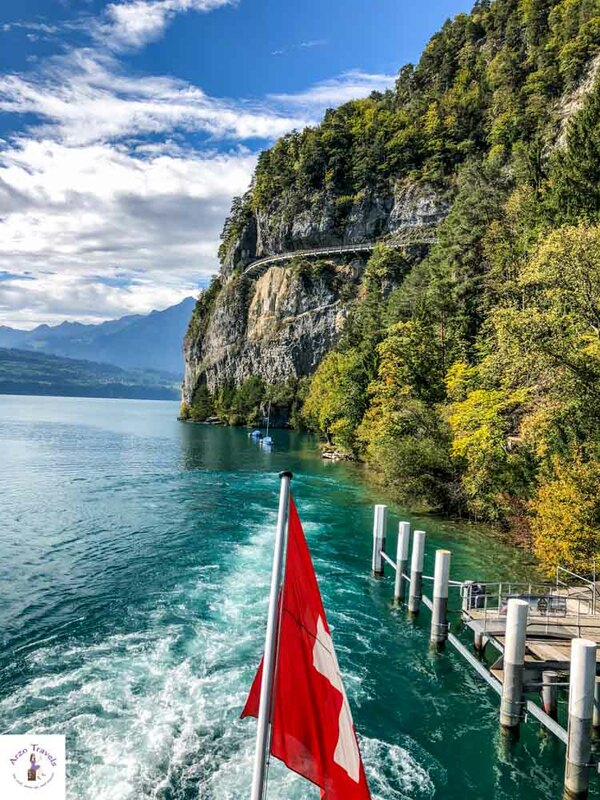 It’s huge too, so as a big boat fan I loved cruising on Lake Brienz and since it is located in one of the most beautiful regions in Switzerland, Interlaken, this lake never ceases to amaze me. 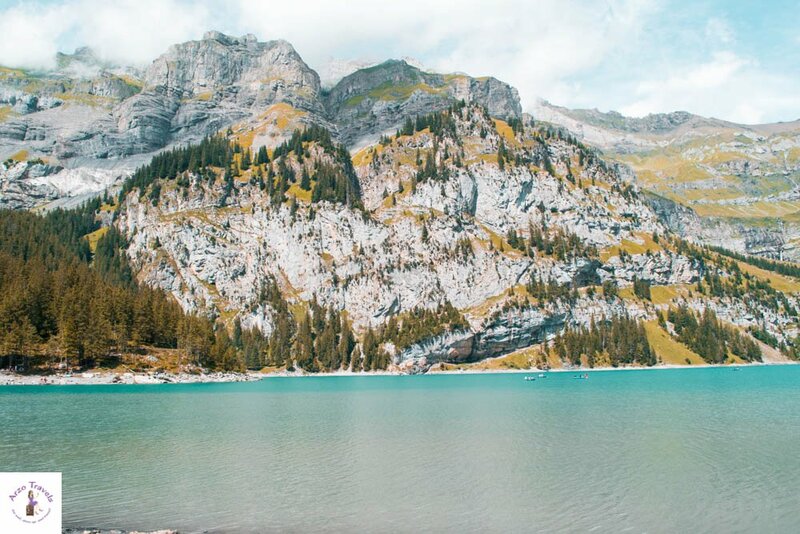 Whether you choose to stroll along the lakeside, cruise on its waters, swim in it or you just want to take time to admire it from afar (by the way the best view is from Brienzer Rothorn or from Giessbach Waterfalls) this lake is definitely a beauty. If you ask me, the area is one of the most stunning places in Switzerland and if you are wondering where to go in Switzerland then you have your answer. 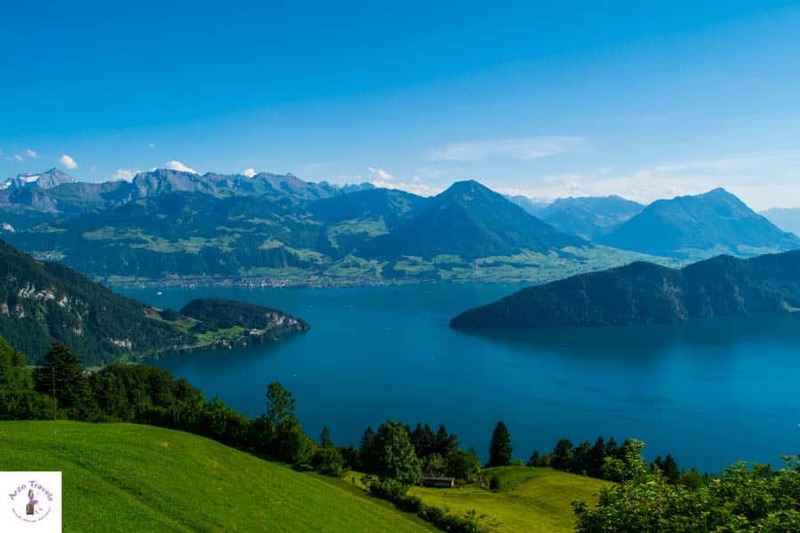 Lake Thun is another top-notch lake in the region of Interlaken. Interestingly, Lake Brienz and Lake Thun were one lake once upon a time. Now, Lake Thun is a beauty in its own right, shimmering in a gorgeous emerald color. While it is a little bit warmer than Lake Brienz, making it a little better for swimming, its large size also makes it great for boat tours and it is definitely a great place to see in Switzerland. To find out more about Lake Thun read my post on the best activities around Lake Thun. You cannot leave Switzerland without spending a day at Lake Zurich. It’s simply lovely during the day with great opportunities to dive into the water or spend time by the lakeside. 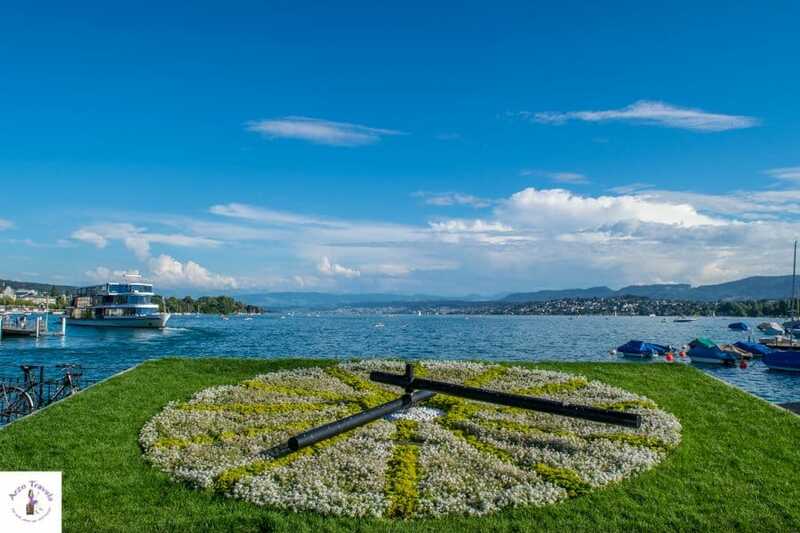 It is also a perfect place to end your day since there is so much going on at Lake Zurich including lots of artists congregating by the lakeside in the evening on a warm day to keep you entertained. So really it is a perfect idea to spend the whole day at Lake Zurich. Long before I had even heard of other places in Switzerland, I knew I wanted to visit Switzerland just because I wanted to visit Lake Geneva. And all I can say is that when I finally did visit Lake Geneva it did not disappoint. It is one of the biggest lakes in Europe and it amazes with its size, color, and range of activities. Whether you like sailing, stand up paddle boarding or swimming there is tons to do at Lake Geneva and it is definitely one of the best places to see in Switzerland. Not only is Lake Geneva great to visit in its own right, you can also visit Montreux from there to have the best of Lake Geneva. Standing at the mountain summit looking down at this lake is a feast for the eyes. 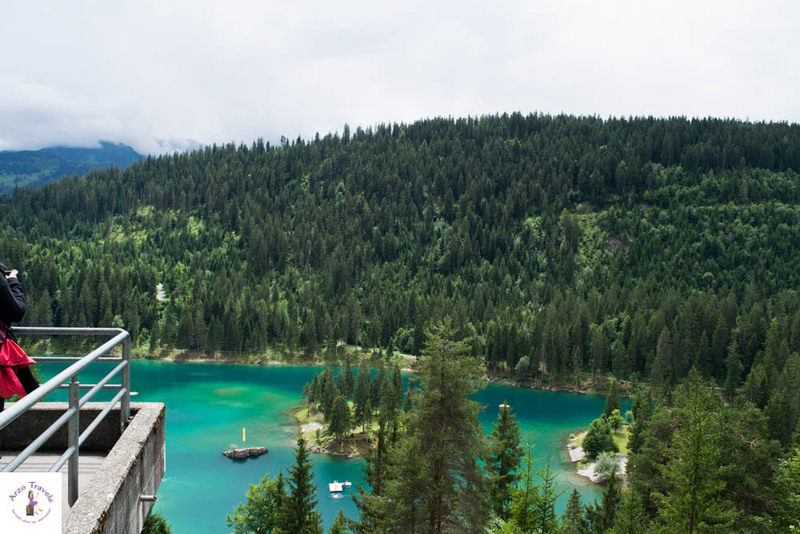 This little mountain lake in Flims blew me away and with its amazing color, it proves that size isn’t everything. If you are not convinced yet, make sure to visit this lesser known area of Switzerland and hike around the area. You can, of course, swim in it or if you prefer you can take a little row boat out on to the water. Bring your rubber ring and grab some food and drink and you can spend your whole day at Lake Cauma and have a great time. It costs a little bit to stay around that area so you will have to pay some entry fees. Lake Lungern is located on the shores of the little village Lungern and is often overlooked. Passing this area by train is one of the most scenic routs but it is worth it, to stop and enjoy the beauty of the place. While Lake Lungern makes a great place to have a picnic or walk around, this view can be enjoyed when driving up the mountain (for most people from Lucerne to Interlaken). It does not come as a surprise that the viewing station there is quite popular and people stop by and take trillions of pictures. Well, it certainly does not surprise me as I am one of those who stops by every single time (yes, I stop here every single time) I am driving this road. This place has its place well deserved in the list of the best places in Switzerland. Without a doubt, Lake Lucerne is one of Switzerland´ gems. Its size, colors, and setting make Lake Lucerne (or in German “Vierwaldstättersee”) one of the most beautiful places in Switzerland. It does not matter whether you strolling along Lake Lucerne in Lucerne, relax in Weggis, head to Mount Rigi or Mount Pilatus to enjoy the view from above, or drive the scenic Grand Tour around Lake Lucerne = this lake knows how to impress and thus it should not come as a surprise that you have to add this place to your Switzerland bucket list. If you prefer smaller, lesser-known places and lakes – but still stunning ones, then Lago di Saoseo is the perfect lake for you. 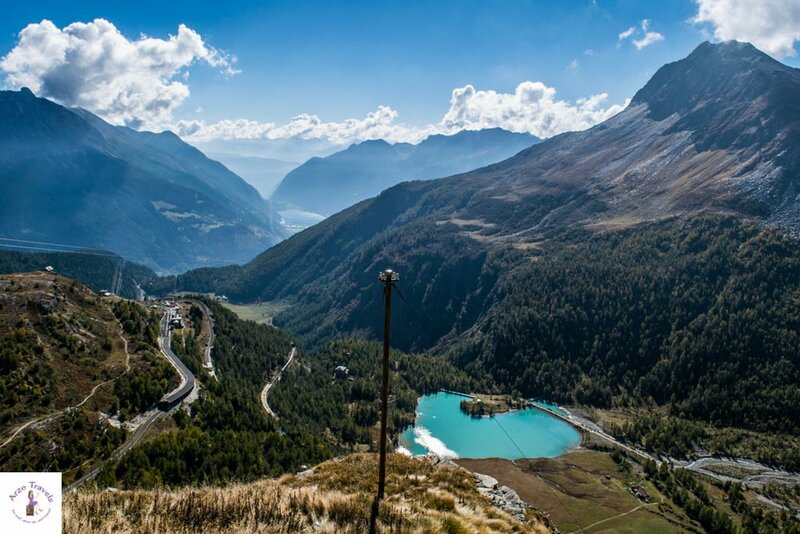 I had never expected to see such a beautiful lake in the region of Valposchiavo – it surely is one of the five prettiest lakes in the country and I can promise you that no pictures do the lake any justice. I would even suggest visiting the mountain lake if you are short in time – because then you really have seen a hidden gem of Switzerland. As you have probably never heard of it you might wonder how to get to this unique lake – and you will find out in this detailed post of mine. Where to visit in Switzerland? Here are more fun places to visit in Switzerland. Switzerland’s biggest city, located close to the German border, is one of my favorite cities and shouldn’t be missed off your Switzerland itinerary. The city is full of beautiful nature, mountains, Lake Zurich and it is home to one of the most expensive streets in the world: the Bahnhofstrasse, which in my opinion it is a must-see place in Switzerland. 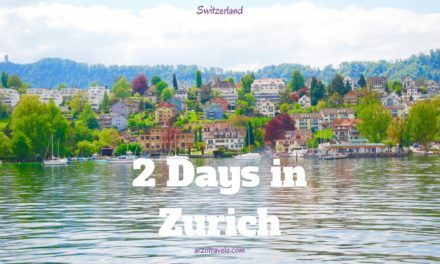 Read more: Check out my Zurich accommodation guide to find the perfect accommodation for your Zurich trip or find out about the best things to do in Zurich. If you want to visit a place in Switzerland that doesn’t feel Swiss, then visit Geneva. Geneva is the only city in Switzerland that has a cosmopolitan feeling which makes it a great place to visit. While there, you can head to Lake Geneva, one of the biggest lakes in Europe, or to do some sight-seeing, visit the UN headquarters or the International Committee of the Red Cross or just go watch shopping. Also, you can see Mont Blanc from Geneva – the white peak only shows on clear days, but it is quite impressive. By the way, Geneva is THE place for luxury watches. You should set aside at least one day to visit Geneva when you visit Switzerland. Lucerne is considered by many as the most beautiful city in Switzerland. I am all into Zurich, but without a doubt, this place is a beauty whatsoever. It is way smaller than Zurich and has fewer activities on offer. 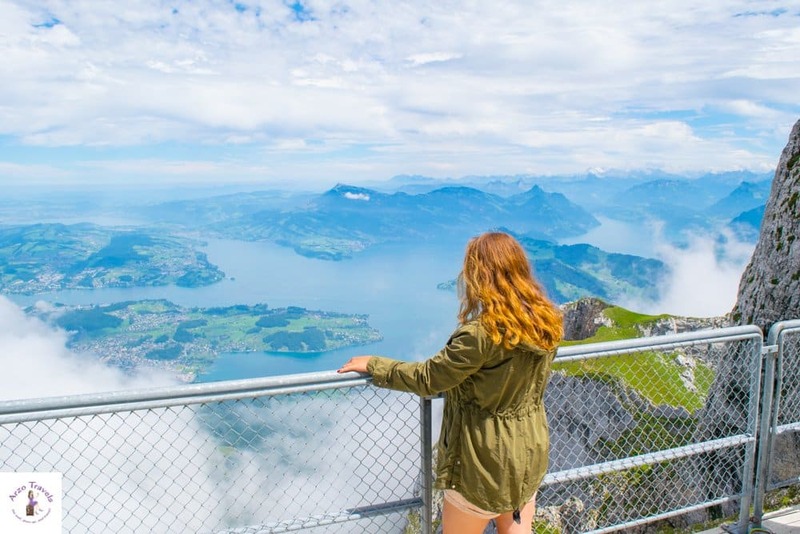 However, walking the world famous wooden Chapel Bridge or strolling through the old town then doing a boat trip on Lake Lucerne or getting on top of Mount Pilatus or Mount Rigi are definitely some of the best things to do in Switzerland. Bern is not only the capital of Switzerland but also one of the best places to go in Switzerland. Whether you head to the Rosengarten for great views of the city, visit the bear family in the Bärenpark, or stroll along the Aare river. Bern is not short of nice attractions. 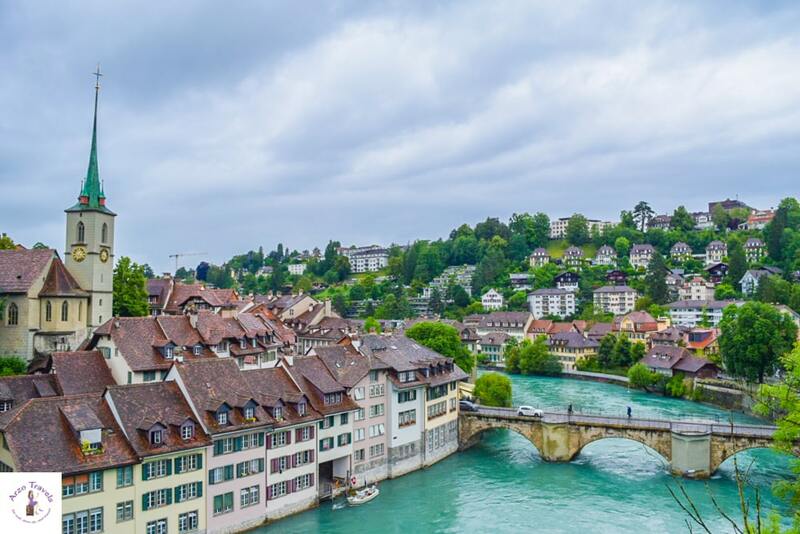 Interestingly, the whole old town of Bern is a UNESCO World Heritage – so getting lost in those streets of Bern is another fun and free thing to do. More Beautiful Places to Visit in Switzerland: Yes, Switzerland has some stunning waterfalls that you should add to your Switzerland itinerary. Waterfalls in Switzerland can be pretty amazing. One of the prettiest places in Switzerland to see waterfalls is Interlaken and its Giessbach Waterfalls. These stunning falls have a total length of around 500 meters over 14 stages. If you are fine to admire the waterfalls from far, you can just do a boat tour where you will pass the waterfalls. 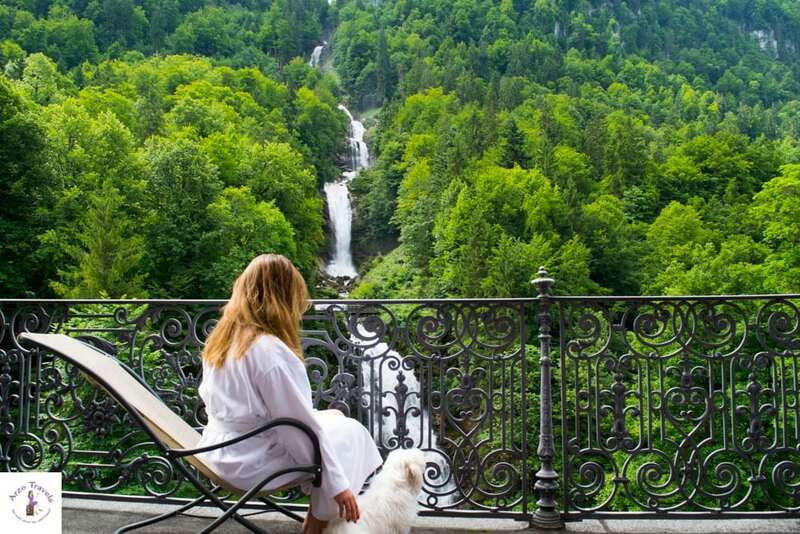 Alternatively, you can hike up to get to the top of Giessbach Waterfalls or if you are at the Hotel Giessbach you can enjoy the most beautiful view from there. Talking about waterfalls, the most powerful waterfalls in Europe are the Rhine Falls. Several hundred cubic meters of water thunder through these impressive falls each second. 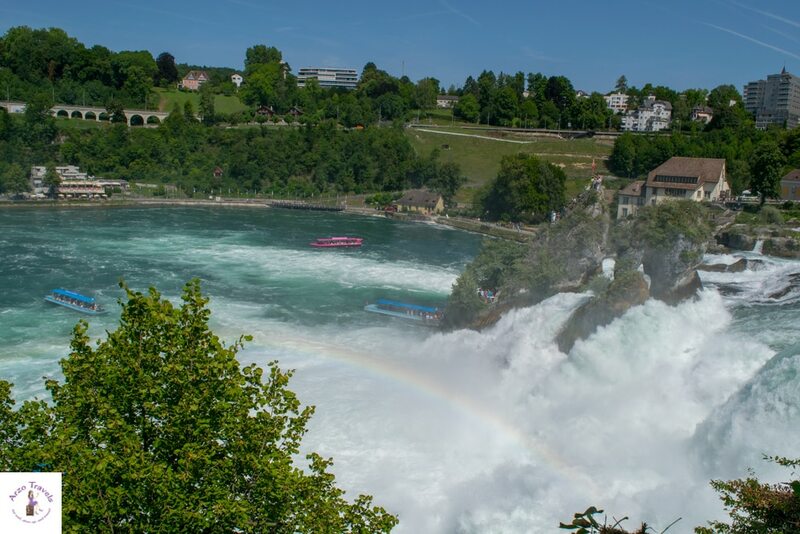 The Rhine Falls are one of the best places to visit in Switzerland and are located close to the German border, or to be more precise, between Schaffhausen and Zurich. To experience this powerful waterfall, you can go to a platform where, if you stretch out your hand out far enough you can almost touch the waterfall! Or, if you prefer, you can get very close if you do a boat tour. My tip would be to visit on a sunny day, but after a very heavy rainfall if possible. With 300 meters height, the Staubbach Falls is not the highest waterfall in Switzerland, but it is still very unique. Located in the beautiful village of Lauterbrunnen, the water looks look very fine dust which explains the origin of the name (Staub=dust). Supposedly, it inspired Johann Wolfgang Goethe for one of his poems, so wandering around this area with the waterfalls in eyesight might be an inspiration for all those who are looking for stunning places to visit in Switzerland. Stein am Rhein is so exquisitely pretty I couldn’t believe it was real. 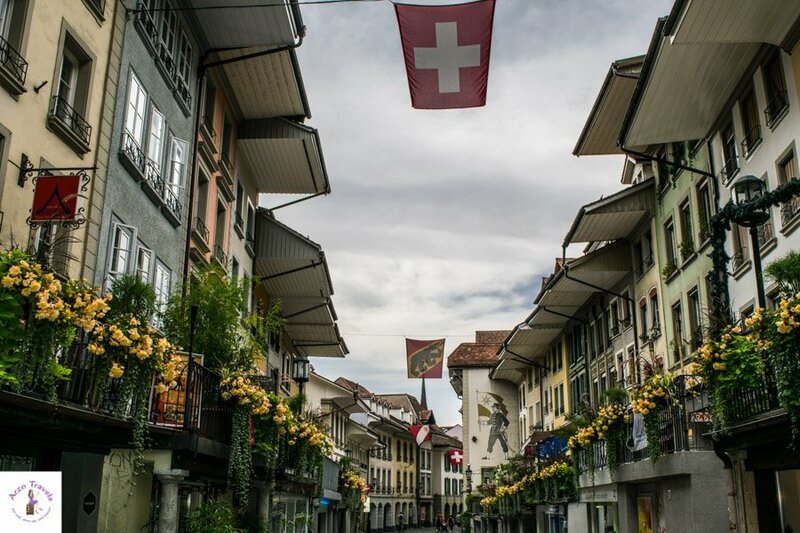 The houses, the facades…despite its small size it is one of the places to visit in Switzerland. Stein am Rhein will leave you speechless and after strolling the old town it is time to enjoy the scenery while walking along the Rhine River. Thun was a great surprise, I drove through it many times but when I finally decided to visit some places I fell in love. 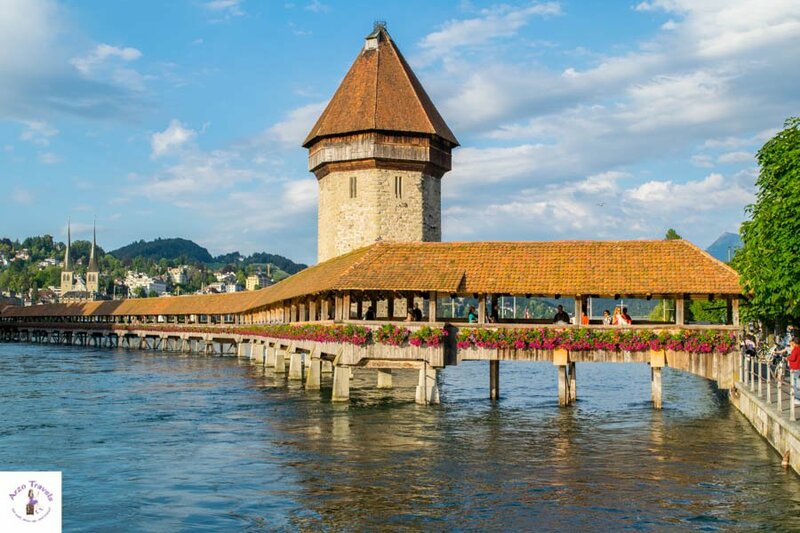 The castles there (Thun is home to several beautiful romantic castles), the old town, Lake Thun….There are many reasons why you should see this place in Switzerland. 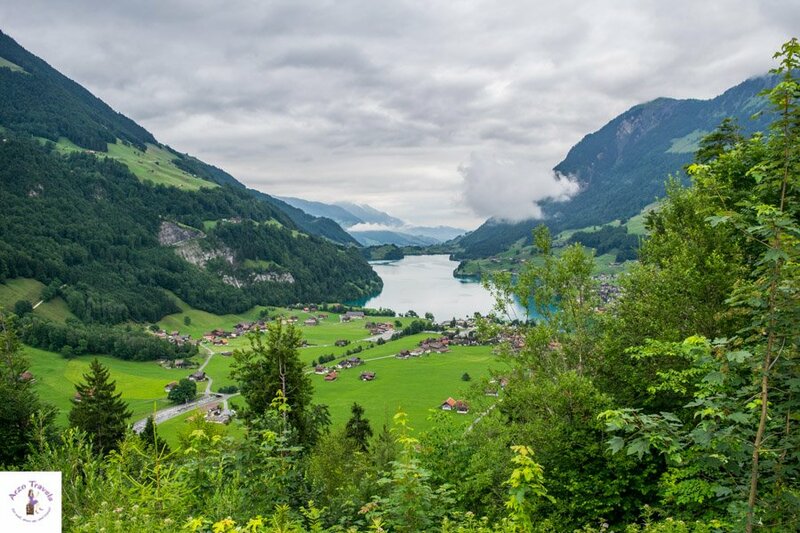 Interlaken is not only a beautiful town in between two lakes- Lake Thun, Lake Brienz – it is also surrounded by stunning nature and one of the best places to visit as an adventurous outdoor fan. I cannot name any spot in Switzerland more beautiful than this area. The old town is a bit unspectacular but the scenery makes up for that. 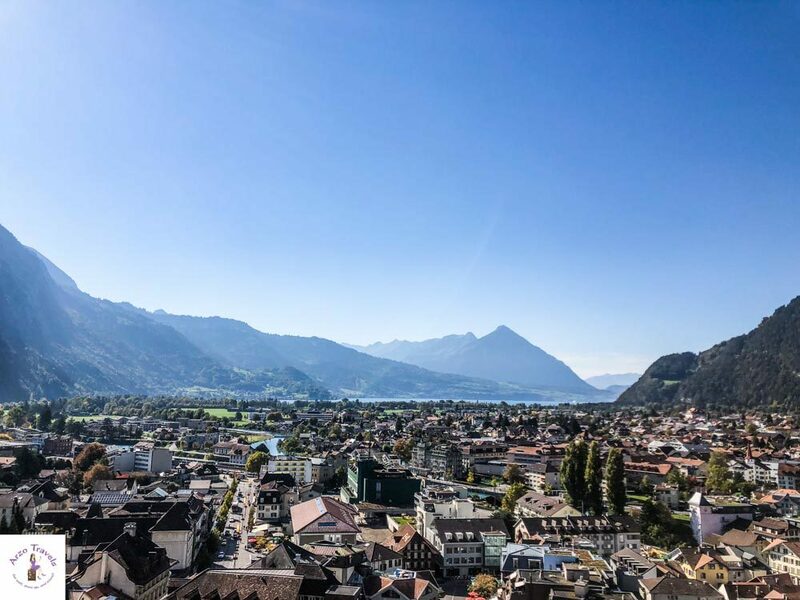 Whether you get up Harder Kulm (Interlaken´ house mountain) or stroll along one of the lakes, you will not be disappointed by this pretty piece of land. If you are looking for a beautiful little town located on the shores of Lake Geneva then Montreux is the place to visit. Montreux is just stunning and owes its beauty to the fact that it mostly consists of flowers and Lake Geneva. 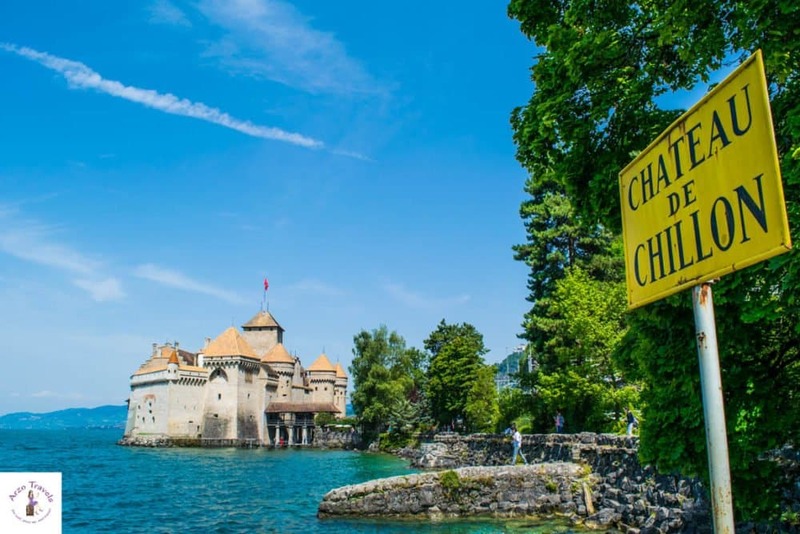 These two facts make it one of the most beautiful places in Switzerland, but you should not miss seeing the vineyards or Chateau de Chillon or the beautiful vineyards which comes with the best views of Lake Geneva. Grindelwald is one of the most popular towns in Switzerland – is indeed very beautiful and it is located in the Jungfrau/Interlaken region with great views of the Swiss Skyline. The town itself is so popular because it is in one of the most visited regions for skiing in and in summer it is a great base for people who like to hike – so whether visiting Grindelwald First or hiking to Bachalpsee Lake – there is no shortage of activities. Cannot get enough? Here are more answers to your question. Where to visit in Switzerland. 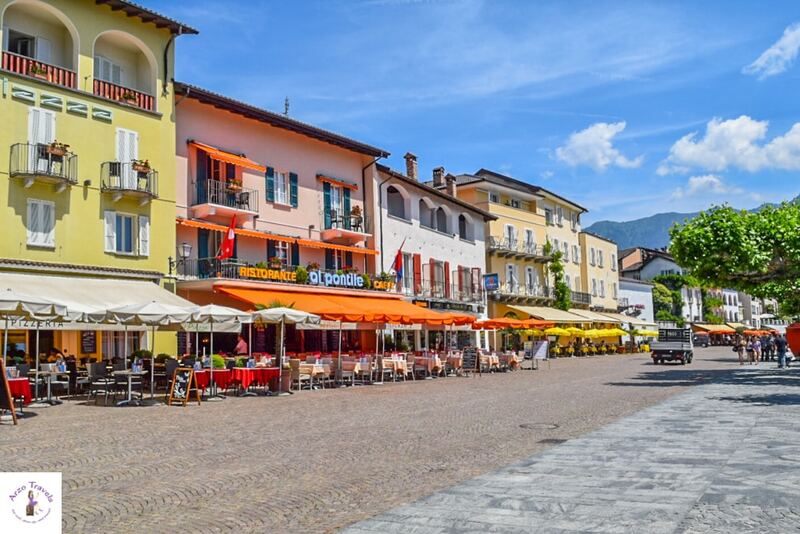 Colorful Ascona, located on the northern shore of Lake Maggiore and just 30 minutes away from the Italian border, is one of the most colorful places to see in Switzerland. 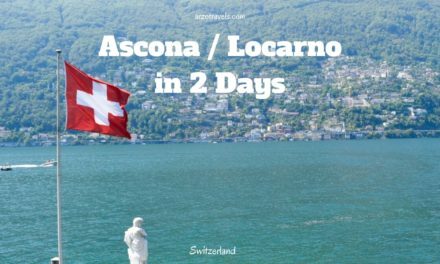 The Old Town and its lively piazza make Ascona one of my top places to visit in Switzerland and the proximity to another absolute gem is another plus (more on this beautiful spot is about to come). 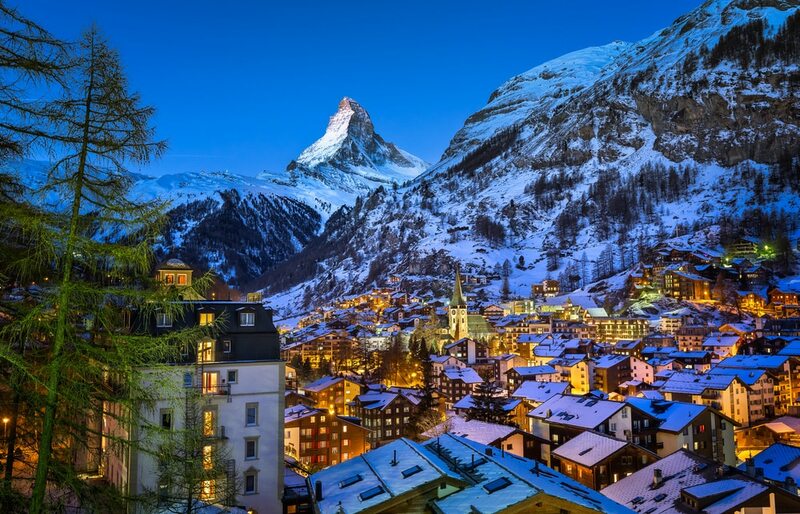 Zermatt is probably one of the hottest destinations in Switzerland – while this is not mean literally, this beautiful picturesque village nestled at the foot of the world-famous Matterhorn is just really….pretty! Whether you head to Matterhorn Glacier paradise by cable car or still Vispa River, you will not be disappointed from visiting one of the nicest places in Switzerland. Seriously, Spies is one of the prettiest places though there is not so much to do and see. You can’t miss Castle Spiez which looms, with its imposing size and huge tower, over the village with the best view of Nissen Mountain. Another important town for your Switzerland itinerary is Lauterbrunnen which translates as ‘many fountains’. Surrounded by the magnificent Alps and boastings as many as 72 thundering waterfalls amongst alpine meadows and mountain inns and is, in fact, one of the biggest nature conservation areas in Switzerland. 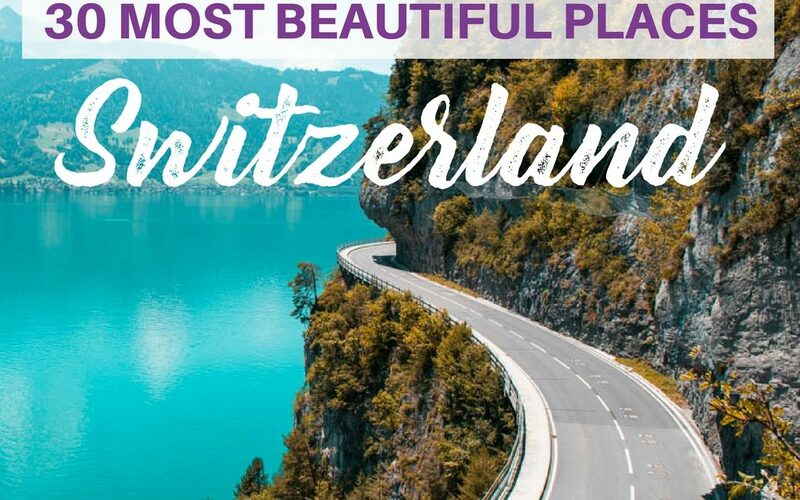 Here are a few impressive places in Switzerland that did not really fit in one of the categories, so my miscellaneous section “Best places to see in Switzerland”. If you are looking for a special place in Switzerland among the stunning mountains and lakes, then the place to visit is Valley Verzasca. You will hardly find a nicer shade of green anywhere and – since it is not a lake – this beautiful Verzasca River is one of the most unique places in Switzerland. 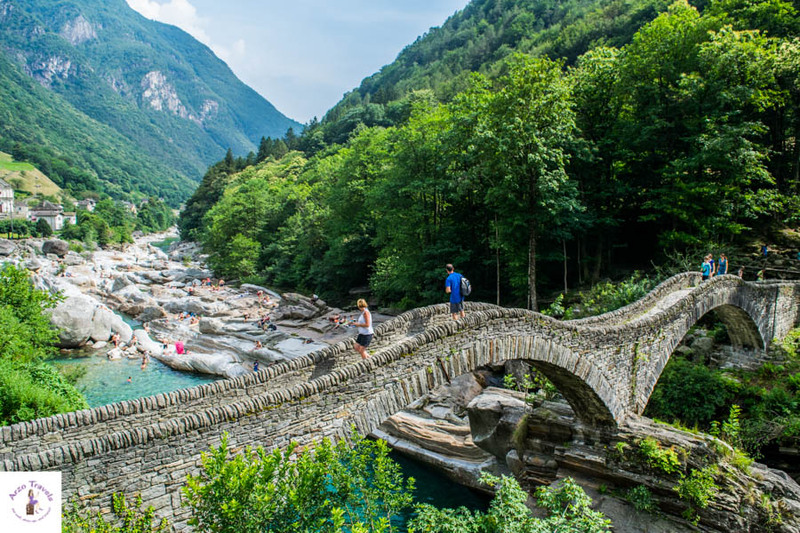 The Lavertezzo Bridge adds additional beauty to this gorgeous region of Ticino. Grabenmuhle has blown me away and I think it is one of the cutest and prettiest places in Sigriswil, in the region of Interlaken. 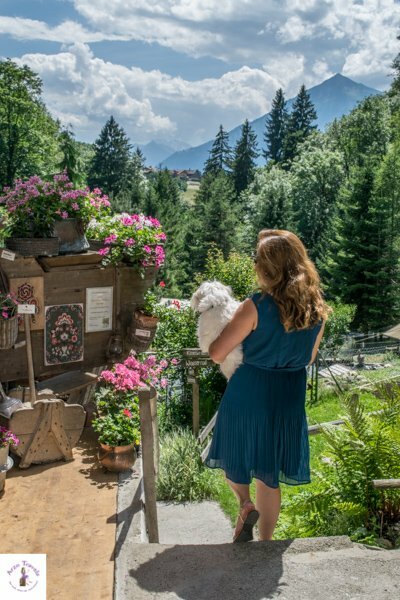 Though I can’t say what exactly it is about it that I love so much, it is kind of a natural park with some cute flower arrangements and a great view of the Niesen Mountain. You can also fish there or you can see the old houses so seriously, don’t ask me what it is but it is a really beautiful place! This hidden gem in Switzerland is my tip for when you are in Sigriswil. It is just a few minutes’ walk from the Sigriswil Suspension bridge too so definitely plan in half a day to see this place and the suspension bridge. The Aescher is also known as the most beautiful restaurant in the world. Visiting it is one of the must-do´ in Switzerland. 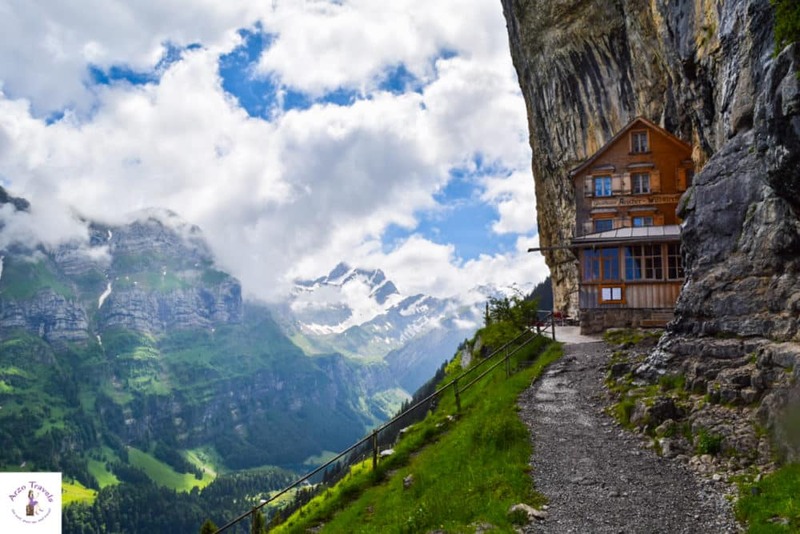 Sitting at the foot of the Ebenalp Mountain, this cliff restaurant (and former hotel) amazes guests from all over the world. The food there is also quite affordable for Swiss standard, so try out their vegetarian Rösti. If you want to have the best wow effect I recommend going up by cable car, getting off there and then hiking down for about 10 or 15 minutes and all of a sudden you will see this beautiful cliff guesthouse where you can take a rest. From there I would recommend hiking down to see the Seealpsee – another beautiful place to see in Switzerland. 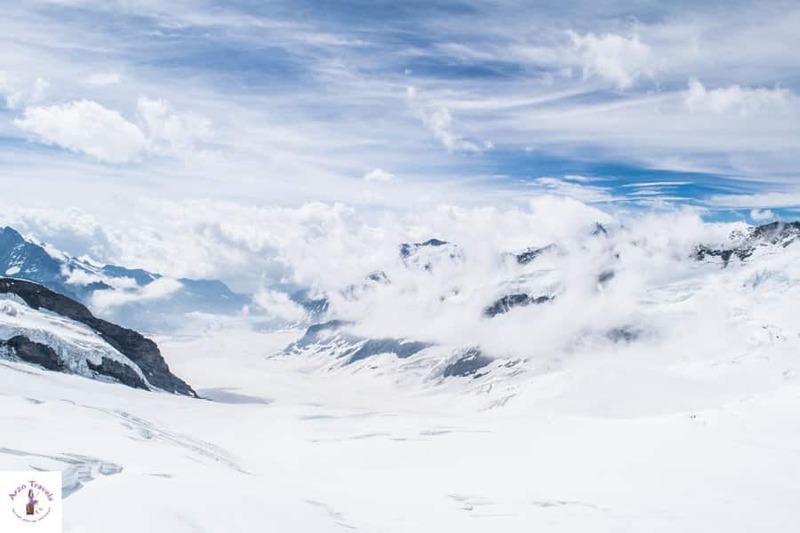 Getting up to Jungfraujoch is probably one of the highlights for many Switzerland visitors. The impressive saddle in the Bernese Alps (connecting the two mountain peaks, Jungfrau and Mönch, at about 3,500 meters) is a popular day trip destination in the region of Jungfrau/Interlaken. Book a train ticket in advance to get up the mountain. The views along the way are often gorgeous, though you also spend a lot of time in tunnels before you arrive at the highest train station in Europe. At the top, you´ll find a lot of attractions like the Ice Palace, Alpine Sensation. But most of all, you have a lot of fun outdoors (p.s. snow is guaranteed throughout the year, so you can imagine how much fun it is for people of all ages – even my dog had the time of his life in the snow). It is one of those places you have to visit (even if the trip is not a cheap one). 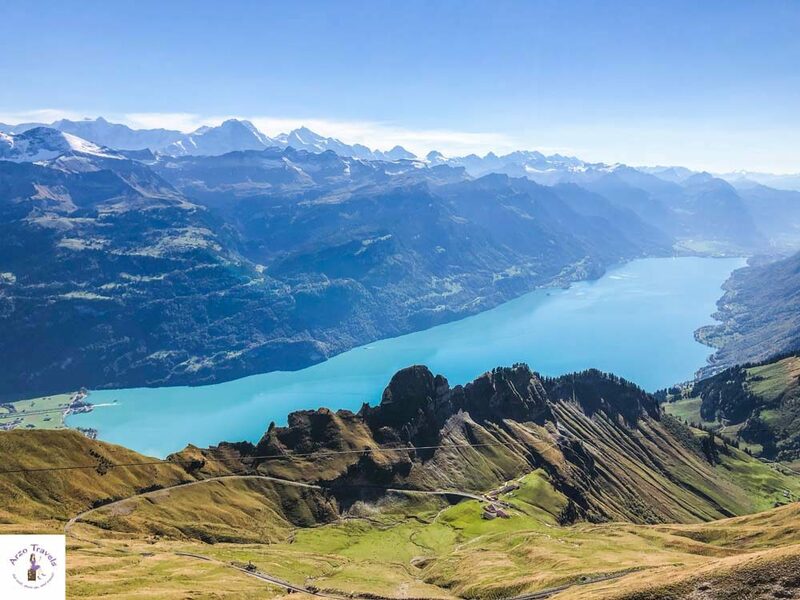 Though I have had countless experiences that took my breath away in Switzerland, my day trip to Brienzer Rothorn was a one-of-a-kind experience. The ride up, in a historic locomotive, was my personal favorite. 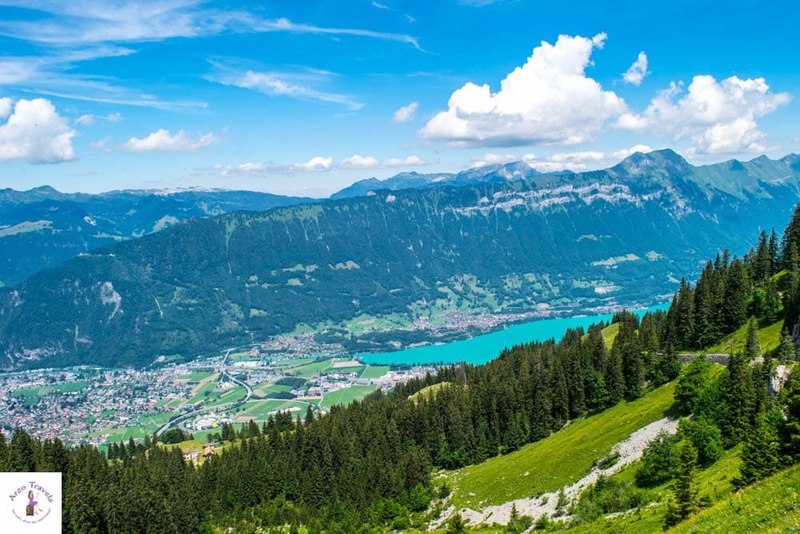 While going up, you´ll have amazing views of Lake Brienz (the stunning turquoise lake in the region of Interlaken) and the mountain range in front of you. You pass short tunnels and meet cows and other animals along the way (the ride up takes about one hour). It is indeed a memory that I will always cherish, and it is my personal top tip when it comes to mountain views. But not only that it is also one of the most beautiful places in Switzerland, so make sure not to miss out on it. What makes Schynige Platte unique is the fantastic view you get. After a 40-minute ride in a cable car, you arrive at Schynige Platte and have a gorgeous view of the Swiss Skyline (which consists of three mountains, Jungfrau, Eigner, and Mönch). And if you think it cannot get much better than that, just take a 10-minute hike through the Alpine Garden and on the other side you have an even better view! This vantage point gives you the best view of Lake Brienz and Lake Thun (two of the most stunning sights ever) at the same time. It did not surprise me that this was so popular among visitors. Two completely different views from one summit! Now, that’s what I call efficiency. My trip to Mount Pilatus did not start well and I was sure it was not worth it (yes, I can be quick in jumping to conclusions). But, seriously, I have to admit (though I was determined to hate it) that Mount Pilatus is pretty great. Not only literally (it is about 2,500 meters high), but the views from there are just breathtaking. It seems that there is a whole new mini-village on the summit, and if you want to do some paragliding, you can even do that up there. Views of Lake Lucerne and the Alps make it one of the top places to see in Switzerland (avoid visiting on Sundays during these months and go very early, so you do not have to wait in line as I did, which almost ruined the trip for me). Last but not least: This stunning mountain peak with one of the prettiest mountain views I have had. Sassal Masone in Valposchiavo. The view of the stunning, turquoise colored lake is just one amazing reason to visit – the stone houses at Sassal Masone, the view of the Palü Glacier – there are many reasons to visit this gorgeous place – which is the most beautiful place in Switzerland to visit. Getting here is just an experience by itself – and I promise you it is not less stunning than the other attractions and places in Switzerland. Find out more about this place and Valposchiavo in general. I hope, you enjoy Switzerland as much as I do and these tips help you to find the best of the best places in Switzerland. 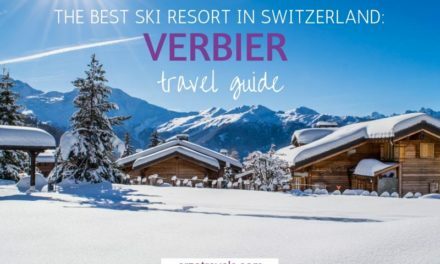 Here are my tips on where to stay in Switzerland – best areas, all budgets.